The Serene Stamper: Stampingly Good Times! Is ' stampingly' a real word? No. But it works for me! I've been stampin' up a storm and lovin' every minute of it! I've got lots of fun samples to share with you. I've been stampin' at clubs, workshops and classes, with friends and solo - and it's been great to get so many cards and projects made! I've been learning new techniques myself, as well as teaching them to other stampers - and we've been having such a good time trying out new things (with great results!). There are lots of incredible deals at Stampin' Up! right now - so be sure to check them out (super gift ideas!) You'll find items between 30-80% off! As with past years, I offer free gift wrapping for items ordered as Christmas gifts (let your friends and family know your stampin' wish list and have them call me!). Or, simply order through my online store and have your goodies delivered straight to your door. Stamp same image on desired patterned paper. Cut out. Glue onto original image on white cardstock. That's it! Easy peasy! For Hedi's card, I also sponged Soft Suede ink around the edges of the cardstock. I love the distressed/vintage look. 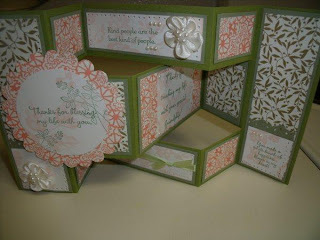 I used my Scallop Edge Border punch to make a rectangler frame. The 'Thank You' was punched out using my Word Window Punch, and layered on a piece of pink cardstock punched with the Modern Label Punch. The red is another piece of cardstock punched with the Modern Label Punch, just cut in half and adhered at the ends of the pink - clever, hey? LOVE THIS PUNCH! I have been using my "Teeny Tiny Wishes" stamp set with the Word Window and Modern Label Punches non-stop - I just think they all coordinate so well together! Oh yeah - I also used the small Oval Punch behind the Thank You too. The Medallion Stamp Rocks. Period. Dot. When you slide the piece of hardware over, the flaps open like a door. Fun. Another fun paper-piercing card. The scallop circle keeps the flap 'locked' in place. I made this card using My Digital Studio from Stampin' Up! as well as 'real embellishments'. This card was sent to my brother, Randy, as a sympathy card for his dog Freckles. Is there any worse heartbreak than losing a pet? Just the worst. Randy loved this card. I wish I could be in BC to give him a hug, but since I can't, at least I can 'send' some love. This card looked AMAZING in real life - the photo does NOT do it justice. This was for my Grandma's birthday. Another new technique - mega easy and mega 'WOW' factor. Simply stamp and emboss on a magazine photo (I used flower photos) - cut out and adhere to card (I used Stampin' Dimensionals). Imagine doing this with a really big butterfly? Or a Christmas tree, using a photo of real pine boughs? The possibilites are endless. Give it try! It's a pop up CHRISTMAS TREE! Coolieo! This is made with the Stampin' Up! Bigz XL Die "O Christmas Tree". I was completely intimidated with making one of these trees (it's like a puzzle) - but once the first one is made the rest are easy and fast to put together. Check out more fabulous samples here. I also used the Medallion stamp for the 'tree skirt'. Shallon & Rosie made pop up Christmas trees too! This is the front of Shallon's card. The red 'shadow' was a touch of brilliance, in my opinion. I also think the 'snow hills' cut out of DSP (Designer Series Paper) was very creative and Shallon's card turned out gorgeous! When I saw these paper flowers online I knew I had to make them immediately. They're my new favorite thing! The jar is decorated with a Decor Element from SU. Click here for directions on how to make these stunning flowers. This would be a terrific project to do while watching TV or a movie. Then you've got petals ready to go whenever you want to make some flowers! I had to try to make on too. Here's mine (yes, using the "Snow Buddies" stamps AGAIN!). Tina, I LOVE all your cards!!! Your site is sooo Inspirational and Beautiful! Your Tri-Fold card is Delightful, so Christmasy! Love it!!! Thanks for sharing so many wonderful cards.